Spider Plants - Surfing Hydrangea Nursery, Inc.
During the winter when we have to spend more time indoors than out, the avid gardener can start to get lonely for plants. This winter, I’ve found the cure: houseplants! I have to admit, I’ve never been the kindest to houseplants. I’m great with shrubs, annuals and perennials outdoors. But for some reason, I’ve never been able to commit to the proper care of live plants indoors. I’ll pick up a Boston fern at Bartlett’s in the fall and watch it slowly languish over the winter from neglect. Generally, it will be pretty much dead by spring and I can toss it into the compost heap about the time I plant my carrots in the vegetable garden. This fall, I decided to try something a little different. I’d been living in a basement apartment, and I knew I couldn’t bare to be down there all winter without some kind of greenery. 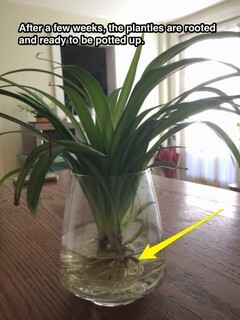 So I committed to keeping my Chlorophytum comosum (Spider Plant) alive. My partner even bought several other plants to keep it company. Of the whole foliage contingent at my place, the spider plant has been the most successful. I’ve moved it all over the house; from the bright, humid bathroom, to the dim, dry living room. It doesn’t seem to care in the least. I’ve let it completely dry out several times during trips off island, and it keeps going strong. In fact, it seems to love it! No matter how much I neglect it, the thing just keeps on pushing out babies left and right. When I can be bothered, I snip off the little plantlets that pop up and dangle over the side of the pot. I stick them in glass of water, and watch them root over the course of a few weeks. I’ve had so much fun that I’ve even potted a few up and given them away to my friends! 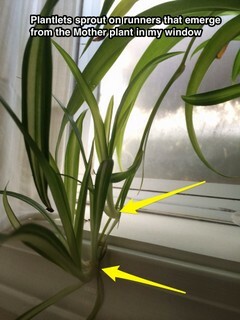 So after turning my nose up at houseplants for years, the spider plant has converted me! I am now a happy indoor gardener. If you’ve killed hundreds of dollars worth of lucky bamboo, diefenbachia and ficus trees like me, fear not! A $12.99 trip to Stop and Shop might make all the difference in your indoor gardening success. Give the Spider Plant a try! Soon enough you too, could have a whole house filled with calming plants to keep you company during the cold days of winter! Copyright 2019 Surfing Hydrangea Nursery, Inc.